Tomorrow I will ascend the stairs at 49 Geary for the best kind of event I can envision: a friend’s art opening. 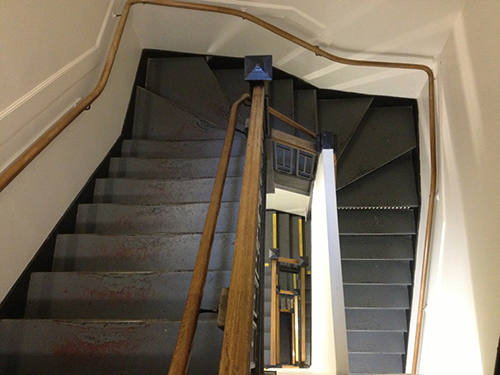 The stairs at 49 Geary are steep and narrow, ascending all five stories of the downtown warren of commercial galleries. They’re unused for the most part, except for times when the desire to see new art makes people abandon elevators and crowd into the stairwell, angling sideways to allow for the flow of both up and down traffic. And while all these things may be true to some extent, it’s the closest we get to the concentrated art viewing experience you get in Chelsea, where an entire day goes by without notice. On First Thursdays in San Francisco, the crowds are both claustrophobic and thrilling. It’s exciting to be in the presence of so many people invested in (or at least curious about) the art in this city, and it’s always refreshing to experience art as a tangible community, an event-driven, object-centered thing, rather than abstract market of high bids, dark climate-controlled storage and shady back room deals.